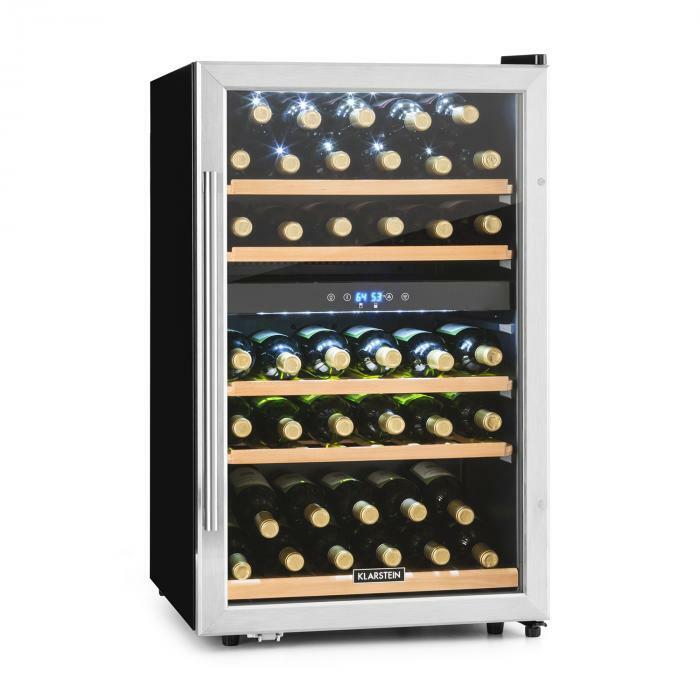 For the love of wine: The Klarstein Vinamour 40D wine cooler provides for the best enjoyment of wine by matching the optimal drinking temperature for red as well as white wines. For the full development of its taste, wine has to be cooled to the right temperature. With the Klarstein Vinamour 40D wine cooler, this turns out to be quite simple - in a classy ambience. 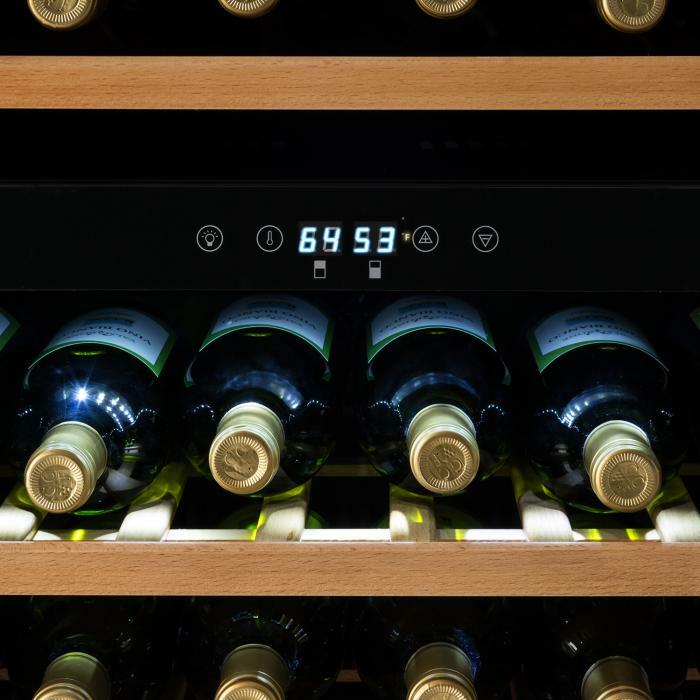 In its upper and lower temperature zones, it can hold up to 41 bottles of wine; five on each of the wooden drawers. The temperature for both cooling areas can be adjusted via the simple control panel with LCD display. This allows white, red or rosé; wine to be cooled precisely. The glass front door with stainless steel frame allows for a skillful presentation of the wine treasures. The switchable interior illumination creates a harmonious setting for the treasures stored inside. Therefore, it is not only an eye-catcher at home but also in bars and restaurants. The temperature for both refrigerating compartments is set with an easy to use control panel with LCD display. This allows white, red or rosé wine, beer and other drinks to be cooled precisely. The beverages can be cooled between 41 and 64°F. 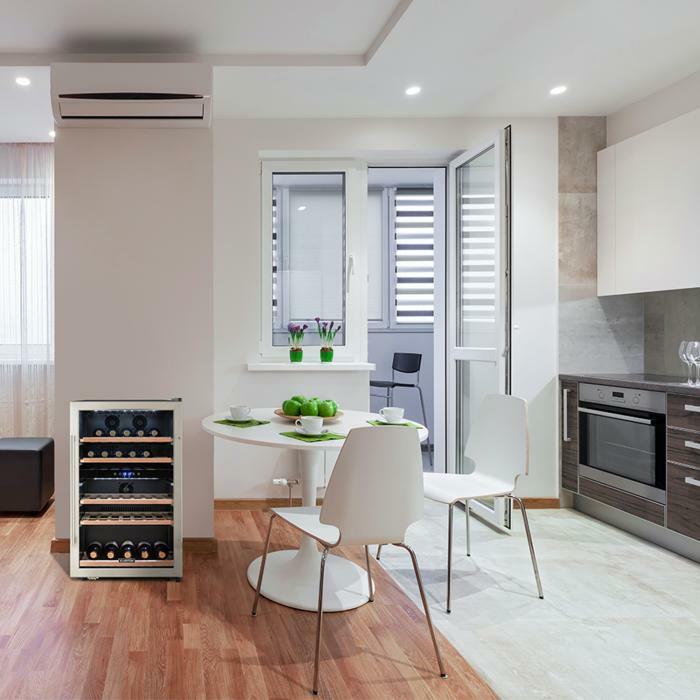 For enthusiast and connoisseurs: The Klarstein Vinamour 40D wine cooler offers stylish storage space for wine, but also champagne and other drinks in two seperate cooling zones. Cable length: approx. 5' 11"